I told my colleagues about my bad luck and Tammy (boss/ Butterfly project mamasan) suggested me to do my new glasses done at Malaya Optical. I remember reading her post when she went there to make her glasses before, so I thought why not. Plus, I won't have to go through the headache of picking the design because Malaya Optical has Ryan Ho, a professional glasses stylist/advisor that would help me transform from zero to hero. 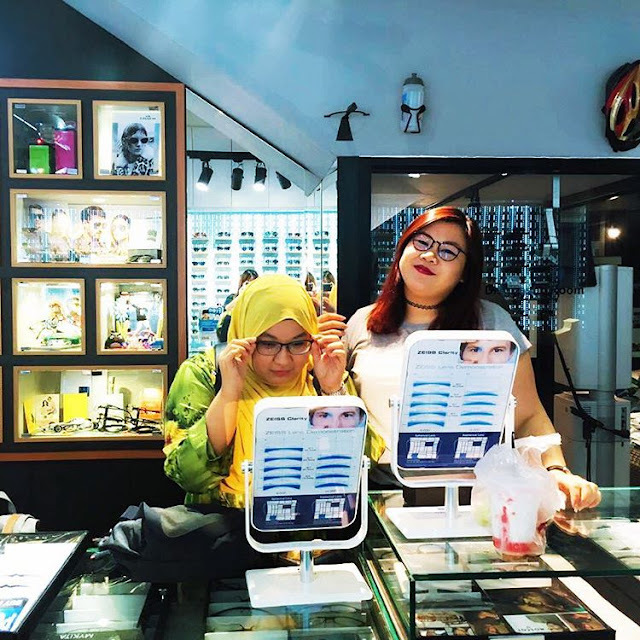 *giggles* Coincidentally around the time when I broke my old glasses, Malay Optical invited us Althea blog editors to meet their team so they can curate a Korean inspired look on each of us personally. How exciting is that right? This KPOP wannabe girl was hyperventilating when she heard the news. We (Sydney, Mira and I) visited their outlet in Uptown, Damansara Utama, right after work and we were greeted warmly by the Malaya Optical family. They had also prepared a bunch of exclusive Korean frames with a different style for us to choose! It took me so long to pick my one-true-glasses but I finally ended up picking a rim shape that I have never use before. Of course, my choice was heavily influenced by Ryan. He helped me a lot when I was torn between two design that I picked. I ended up opting for Frank Custom glasses, with an almost oval-ish rectangular shape. The rim is grey/blackish in colour but is not totally opaque. It's a little translucent in some part, which gives the glass a nice dimension under the sun/when exposed to light. The nose pads and temples are made of B-titanium which makes it more flexible while adding a touch of exclusivity to it. I am also so happy with the Carl Zeiss lens that is used for my glass as I know its good reputation for a glasses lens. 1. The Slit Lamp with Optical Digital Zoom Camera by Nikon (to examine contact lenses fitting and cataract). 2. Non-Contact Relax Tonometer by Reichert (to examine Intra Ocular Pressure, IOP or Glaucoma). 3. High Definition Digital Retina Imaging by Canon (to examine Diabetic Retinopathy, Macular Degeneration or Retina Atropy). 4. Zeiss iProfiler Ocular Wavefront Aberrometer. 7. Keratometer (to examine Refractive Errors up to 0.125 Diopter and also Corneal Curvature for a better fit of soft or RGP contact lenses). 8. Zeiss Relax Vision Terminal (to examine pupillary distance and multifocal precision fitting height). You can liaise with their professional to get further information on all these tests. Thankfully, my eyes are free from any problem. (Phew!!) It kinda scares me actually considering how often my eyes got exposed to the computer screen on daily basis. Thank goodness!! My glasses are done in just a week (I need to wait since they need to order the lens) and soon after it's done, Malaya Optical sent me a text to remind me to pick it up!